Kefir is a popular and delicious fermented drink, using bacteria and yeast, which is healthy and great for you. 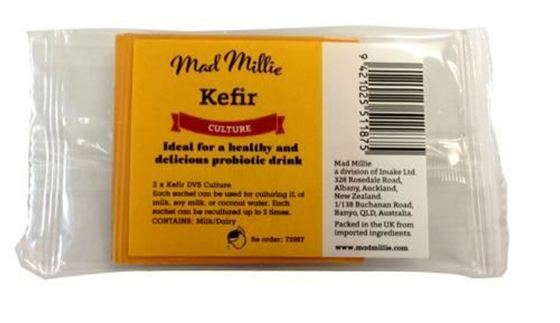 Mad Millie Kefir Culture contains 7 bacteria strains and 1 yeast strain: Lactococcus lactis subsp. cremoris Lactococcus lactis subsp. lactis Lactococcus lactis subsp. lactis biovar diacetylactis Leuconostoc Lactobacillus acidophilus Streptococcus thermophilus Bifidobacterium species Candida colliculosa Store culture in freezer. Each sachet can be used for culturing 1 L of milk, soy, juice or coconut water. each sachet can be recultured (see kit instructions) up to 2 times.